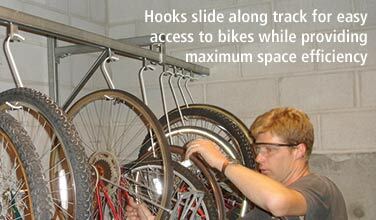 I bought this hanging bike storage system on a recommendation from a bike junkie friend who owned 8 or more bicycles. Tandems, single speed, mountain bikes, road bikes: you name it, he had one, and he stored it on his track rack. 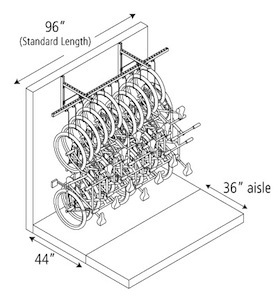 My friend did the heavy work with the research and ultimately recommended the Dero Track Rack when I asked him how to solve my bicycle storage problem. The track went into the basement ceiling with no problem at all: lag bolts into the overhead joists. The track is super strong. The rollers that install in the track look like they are machined to aircraft standards. In short the whole getup is first rate. The track has rollers that glide along the track and suspended beneath are a number of “S-hooks” from which you hang the wheel of a bike. What is amazing is how you can move the bikes along the track much the same way you slide shirts in your closet…only easier. 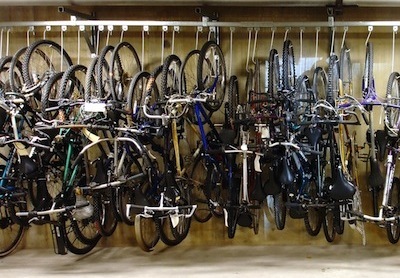 The Track Rack has been a lifesaver for me, and now all my bikes are neatly organized and hang from the ceiling. They are secured so there is absolutely no chance they will be knocked over by anybody. The Track Rack has moved from the basement to the garage, and when I sold the house I made sure to take the Dero Track Rack with me. I can’t see ever parting ways with my Dero Track Rack. It is THAT cool.